Rogue was tasked with brand creation and to develop a vibrant and creatively integrated campaign to launch Azuru in Ireland and generate demand from consumers, bars & wholesalers. The goal of the campaign at this point was to introduce Ireland to a premium, exciting new beverage, and to have it occupy a unique place among the target consumers through a particular style of branding within the Irish alcoholic beverage market. Rogue embraced the origin story of Azuru and explored the many elements contained within it in order to develop the creative ideas designed for this product. Finding the creative meeting point of the ancient origin story and the youthful market to which we wished to communicate, we agreed upon the creative concept of “Old Legend, New Spirit”. Using this creative idea, Rogue developed a PR strategy, launch event, guerrilla marketing campaign and new website to announce the arrival of Azuru. This campaign was aimed at local, national and broadcast media. To create an initial interest among the target market, and to introduce Azuru in a fashion fitting its image. Our solution was to build an online presence that made the brand appear larger and more established in the target market than it actually was. Consumers perceive large drinks brands as having a long heritage, when in fact they are less than a decade old. In order to overcome this issue, we carried out premium product photography and built the website design around these high-quality images. 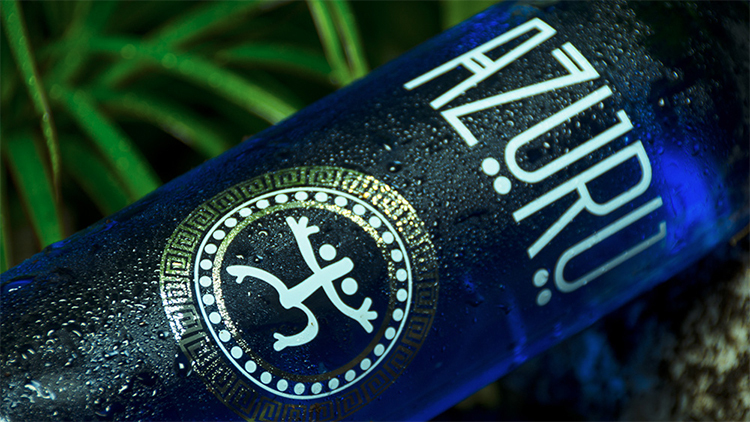 Utilising such professional photography, Azuru was perceived as a larger, well established, household name and not just a new drink to hit the Irish market. Partnering with local bars across Ireland, we created a selection of eye-catching POS materials to help Azuru stand out at the point of purchase. Premium product photography and bespoke website design. Rogue also developed a highly promoted Facebook campaign that was intended to give fans the chance of becoming an Azuru brand ambassador for one year. The campaign ran for eight weeks and incorporated a custom application section on the website through which fans were asked to explain why they felt they would make the perfect ambassador. Two fans will be chosen in each of our twenty locations, after this they will progress to round two where they promote the brand for one night in a specific venue. One winner will be chosen from each event and entered into the grand final held in Krystle nightclub in Dublin. Rogue will manage the final event in Krystle where fans, friends and celebrities are invited to attend the grand final where one brand ambassador will be chosen.